In south Wales. Not to be confused with the A48(M). Or the A48(M). Or come to think of it, the A48(M). Or even if you squint a little, the M48. No, really, I'm not. There are a huge number of different motorways that have the number "48" in them, and they're all at least partially in south Wales. OK, OK, OK. Tell me about this particular one. OK, it was planned to be in Cardiff, much like today's A48(M). The big difference is that instead of heading into and out of the city from the east, the Llantrisant Radial would have been located to the west of the city centre. It would have been the main route out of Cardiff in that general direction instead of the rather half-baked way that people currently have to travel. As well as that little lot, there was a New Town proposed in the Llantrisant area, and so this road would have been a valuable way to get the population in and out of Cardiff. In the early and mid-1960s, many large towns, cities and conurbations were looking very carefully at their future highway provision. It was a good time to be a highways consultant. Cardiff was no exception to this rule, when in 1966 the Cardiff Development and Transportation Study was published. Known in the marvellous way these things are as the Buchanan Report (mainly because the chief consultants were Colin Buchanan and Partners), it identified a whole pile of future roads for the city most of which never saw construction, which was then added to in the follow-up report published in 1968. What made the Llantrisant Radial more interesting than most of the proposals is that it wasn't going to be built and maintained by Cardiff City Council, but instead it would be a Trunk Road managed by the Welsh Office. Remember that this was in the days before the M4 bypassed the city, and the main Trunk Route was the A48, pretty much straight through the centre of the city, so the upgrade to the Trunk Road was Trunk itself. It also appears to be the only one of the proposed new routes within Cardiff to have its number officially allocated - again, probably because of its status as a proposed Trunk Road. In the early days of the proposal, it was felt that the route through Cardiff (made of the present A48(M), A48 Eastern Avenue and the Llantrisant Radial) was more important than what became the M4 bypassing the city on the northern side, so much so that the Llantrisant Radial was given a high priority and the M4 was given a much lower one - indeed it was originally not expected that the M4 would be required before the late 1980s, whilst the Llantrisant Radial was due to open before the mid-1970s. In October 1968, the Welsh Office put the route out to yet more consultants. Which was a bit of a surprise as only a single route had earlier been identified within the Buchanan Report and it was assumed that that route was indeed the one that was going be be used. However, the Report had been commissioned by Cardiff City Council, not the Welsh Office, and as a Trunk Road, the Welsh Office then had to reopen the whole thing, even if it did end up as a box-ticking exercise and the final confirmed route from the summer of 1969 was indeed that found in the original Buchanan Report. It didn't take long before protests started. The route of the Llantrisant Radial, not surprisingly, ran through residential areas on the eastern side and those residents were not fantasically happy about the prospect of their houses being demolished for the new road. The first questioning of the route in Parliament happened in November 1968, before even the route had been finalised! As was the way of things back then, whilst the complaints within the city about the proposed road network reached the City Council's ears, the Welsh Office, being somewhat more removed from the whole thing, carried on regardless. Well, until 28 April 1971. Suddenly all bets were off. The Welsh Office had finally noticed that people weren't too happy about the prospect of losing their homes to a motorway, and had a bit of a panic attack. Building the M4 to the north of Cardiff seemed like a safer, less controversial bet, and they started looking for their exit strategy. At a meeting of the Welsh Grand Committee, they announced that the Llantrisant Radial was "to take a lower priority", and to be "the subject of further discussion with Glamorgan County Council and Cardiff County Borough Council". 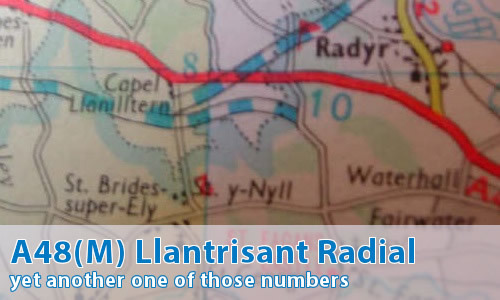 With what seems like huge haste, and despite the fact that the A48 was still a Trunk Road, they dropped the whole Llantrisant Radial mess in the laps of the local authorities before the end of June 1971. The local authorities immediately downgraded the route, and by November 1971 it was no longer proposed to be a motorway, before being finally killed off, along with the vast majority of Cardiff's plans before the end of 1972. But that's not quite the end of the story.